I’ve always found this well known Bible verse to be a bit… intimidating. I mean, is anyone really arrogant enough to think that this is attainable, apart from Christ? It’s quite the standard, no? Peter uses it to accentuate what the Christian life should look like. The dependence upon, the assurance in, and the imitation of… Christ. This command to “be holy” was first declared by God to Moses, after God had clearly defined to Moses the difference between clean and unclean animals. Then, approximately 1,500 years after Moses had recorded the Levitical Laws and documented this concise little summary from God, Peter references “be holy” in his first epistle, in order to briefly underscore for the brethren the importance of living a Godly life. It’s a powerful, little phrase. It almost seems odd that God would suddenly give this summational command to “be holy”, here, within the detailing of the difference between clean and unclean animals. It doesn’t seem to fit. I mean, why not proclaim this phrase after the giving of the Ten Commandments or as part of the oracle upon entering the Promised Land, no? Surely these are much more dramatic moments for such a pithy summary, right? However, Peter’s usage of “be holy” in his first epistle, in order to underscore his encouragement to the brethren, actually makes sense. I think the “be holy” phrase is extremely personal to him, and for Peter there is no better way to bring home his point to uplift and to inspire the brethren, than to do it as personally as possible. The next verse then describes how Peter was inwardly perplexed. Could you imagine the perceived, seemingly mixed signal that Peter was facing from God? His whole life had been a continual reminder, as a first century Jew, to make the never-ending effort to be clean, and now God was promoting a practice of uncleanliness? That vision of the sheet which included unclean animals, along with God’s personal command to kill and eat, was the catalyst which brought it all together for Peter: the three years following Christ around Palestine, the miracles, the proclamations of Jesus that He was God, the social unrest and political climate surrounding the climax of Christ’s incarnation and ministry, the prediction by Christ that Peter would deny Him, the crow three times sounding which confirmed the prediction of his denial, the crucifixion, the resurrection, Christ’s appearances to the disciples over 40 days, Jesus’ personal inquiry of Peter as to whether he loves Him, Jesus’ repeated command to feed His sheep; all of it now became clear to Peter. Again, that moment in the city of Joppa where Peter saw the vision was the moment that Peter realized that the elect of God went beyond the Jews exclusively. It was the moment that he had learned that the Gentiles are also part of God’s salvific plan. It was a complete mind blow, to say the least. Here, in Acts 11:1-18, Peter is now sharing that vision experience as evidence for the “circumcision party” in order to make the case that the Gentiles have also “received the word of God”, just as they had. A few years later Peter would then write to the brethren, in order to encourage them in his epistle to “be holy”, just as God had declared to Moses after He had defined the difference between clean and unclean animals. Are you yet catching the connection between the quote and Peter’s epiphany? The point is, I don’t think it’s a coincidence. 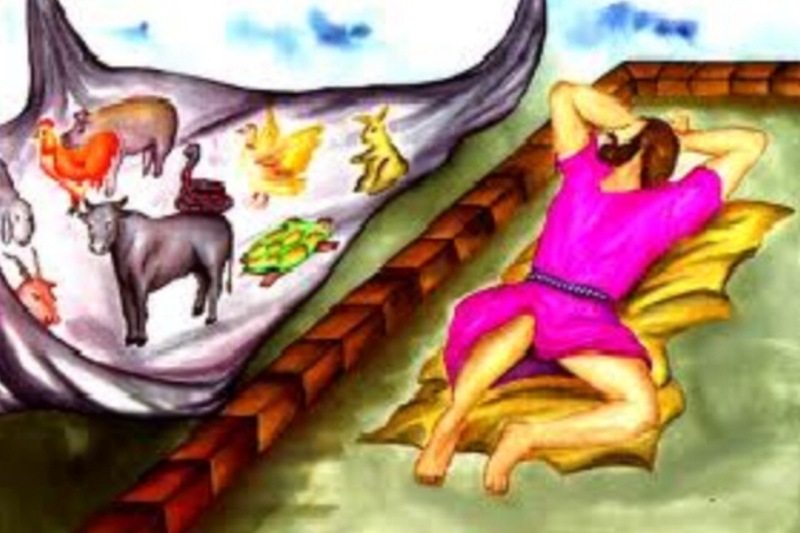 Maybe, Peter went back to the scriptures after the vision experience to look up and confirm the regulations, and then he stumbled upon the phrase in the Levitical Law (God’s seemingly random underscore to “be holy” amongst the instructions about which animals are clean and unclean). It must have jumped off the page! Maybe not. Who knows? But, it’s a possibly interesting connection none the less. It’s also interesting that Peter is the only New Testament writer to reference “be holy” from the Pentateuch. Personally, I don’t think that the placement of “be holy” in that particular place in the Levitical Law means more to anyone else in history, than Peter. His reference to it in his epistle, in order to encourage the brethren, was extremely personal. I can’t help but think that that moment stuck with Peter for the rest of his life, and for him to reference “be holy” was something very special. May we (Christians) adhere to the dependence upon, to the assurance in, and to the imitation of… Christ. May we be encouraged by Peter’s reference of God’s call to “be holy”… for Christ is holy. Thanks! It’s amazing how deeply personal the scriptures were to those whom God spoke through.